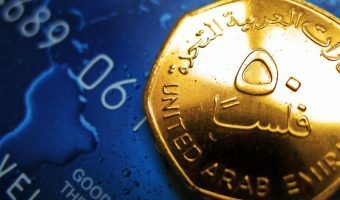 Visiting the malls of is the shopping experience of choice for most visitors to Dubai, even though most of the real bargains are actually found in the city’s souks. They are also home to most of the city’s cinemas, plus a large proportion of its restaurants, tourist attractions, and entertainment options. With more than 1,000 shops spread over four levels, the Dubai Mall is by far the biggest shopping and most popular mall in the city. Large stores here include Bloomingdale’s, Galeries Lafayette, Debenhams, Marks & Spencer, and Paris Gallery. Inside the mall there are a number of top class attractions such as the Dubai Ice Rink (the city’s biggest ice skating rink), KidZania (a children’s edutainment theme park), the Dubai Aquarium & Underwater Zoo, and Reel Cinemas (a multiplex cinema with 22 screens). The mall is situated at Emaar’s massive Downtown Dubai development, also home to the Burj Khalifa (the world’s tallest building), the Dubai Fountain, and the Souk Al Bahar. 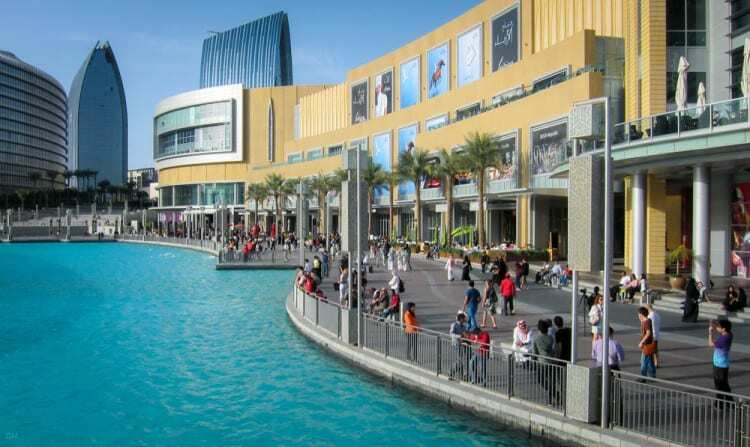 The Mall of the Emirates in Al Barsha is another large shopping mall with lots of attractions and things to do. Anchor stores include a Carrefour hypermarket, the biggest Harvey Nichols store outside the UK, and a Debenhams department store. A recent addition is the Fashion Dome; an extension featuring high-end retailers such as Giorgio Armani, Paul Smith, Versace, and Galliano. Despite the extensive retail offerings, the mall is perhaps best known for Ski Dubai, the first indoor ski slope in the Middle East. Other attractions include VOX Cinemas (a 14-screen multiplex cinema), Magic Planet (a children’s entertainment centre with rides and arcade games), and the Dubai Community Theatre and Arts Centre. Thanks to its size and great location right next to one of Dubai’s busiest Metro stations, the BurJuman is one of the most popular malls in the city centre. Deira City Centre is an older mall more popular with residents than tourists. 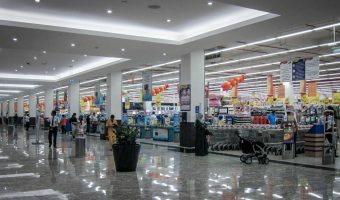 The three floor mall offers more than 350 shops including large branches of UK department store Debenhams, luxury goods retailer Paris Gallery, Woolworths, Virgin Megastore, and electronics giant Sharaf DG. For groceries there’s a large Carrefour hypermarket. Leisure offerings include an 11-screen multiplex cinema and a children’s entertainment centre. Mirdif City Centre opened in 2010 and is situated in Mirdif, a rapidly expanding residential area east of Dubai Creek. It is well off the tourist track but boasts a number of attractions that appeal to visitors such as a multiplex cinema, tenpin bowling alley, and an indoor skydiving facility. The Dubai Marina Mall is convenient for visitors staying in Dubai Marina, Jumeirah Beach Residence, or Jumeirah Lakes Towers. Although relatively small by Dubai standards, it boasts a number of restaurants with great views of the marina plus a rather nice, boutique 6-screen cinema. Those staying in self-catering accommodation can shop at the Waitrose supermarket here. There’s even more choice at the Ibn Battuta Mall, a shopping mall themed around the adventures 14th century explorer Ibn Battuta and a short Metro ride from Jumeirah Lakes Towers and Dubai Marina. Anchor stores are H&M, Sharaf DG, Paris Gallery, and Debenhams. For grocery shopping there’s a large Geant hypermarket. 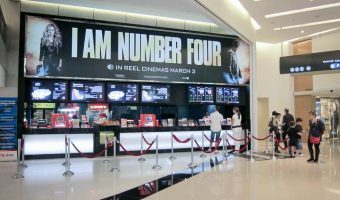 Entertainment options are a 21-screen cinema with the only IMAX theatre in the city, a tenpin bowling alley, and an family entertainment centre with video games, rides, and children’s play area. The Ibn Battuta Mall isn’t the only themed mall in Dubai. The Wafi Mall is an Egyptian-themed mall in Umm Hurair with a large Salam department store and a branch of Marks & Spencer. The Pyramids and Fort complex next to the mall features a number of licensed restaurants and bars and even shows free movies once a week. Khan Murjan, an underground souk at Wafi City, is a great place to buy Arabic souvenirs and also boasts an excellent restaurant. Mercato is the largest mall in Jumeirah and is themed around the Italian Renaissance. It’s anchored by a large Spinneys supermarket and also boasts a cinema and family entertainment centre. Other shopping malls in Dubai include the exclusive Boulevard at Emirates Towers, the Festival Centre at Dubai Festival City, the Oasis Centre in Al Quoz, Al Ghurair Centre in Deira, and Lamcy Plaza in Oud Metha. Shoppers looking for real bargains should head to the DragonMart in International City, a vast warehouse packed with cheap Chinese imports. Last season’s fashions can be picked up at heavily discounted prices at the Dubai Outlet Mall in Dubailand. Nearly all malls have a good choice of places to eat. Options are typically split between sit-down restaurants and fast food outlets food court (usually found in a food court located near the cinema or other entertainment area). Most are usually part of a chain. A typical food court in Dubai usually has a significant proportion of American brands such as Pizza Hut, Burger King, Subway, and McDonalds, while the remainder offer a variety of cuisines that reflect the city’s diverse international population. Common offerings include Yo! Sushi (Japanese), Karam Express (Lebanese), Panda (Chinese), Lemongrass Express (Thai), Noon O Kabab (Persian), and Bombay Chowpatty (Indian). The sit-down restaurants are less homogenous. Nevertheless, the same names keep cropping up at every new mall that opens. Paul (French), TGI Fridays (American), Tony Roma’s (American steakhouse), Wafi Gourmet (Lebanese), California Pizza Kitchen, and many others, all have multiple outlets across the city. In general, the restaurants at shopping malls are not licensed to serve alcohol. However, where there is a hotel attached to the mall, there are usually a few establishments that have an alcohol license through the hotel. 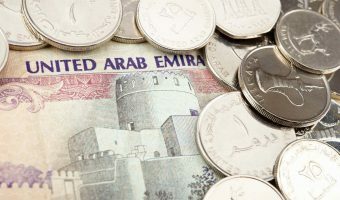 Examples include many of the restaurants at Souk Al Bahar in Downtown Dubai (next to the Dubai Mall), most at the Souk Madinat Jumeirah, and a few at the western end of the Mall of the Emirates. All the major malls are open every day of the week. Standard store opening times are typically Sunday to Wednesday 10 am to 10 pm, and Thursday to Saturday 10 am to midnight. Restaurants and entertainment venues often close an hour or so later. Specialises in computers and IT products. Small mall close to the border with Sharjah. Shopping mall in Deira. Stores include Carrefour and Centrepoint. Small mall with computer and electronics shops. Community shopping mall in Al Mizhar. Located in Bur Dubai, BurJuman is a classic, family-friendly community mall with an eclectic mix of stores to suit every taste. Shopping mall in Al Shindagha. Stores include Carrefour, Babyshop, Max, and Splash. Centrally located 3-floor mall with a multiplex cinema, entertainment centre, and food courts. Mall in Dubai’s International Media Production Zone. Community mall with more than 400 stores, a cinema, and several entertainment centres. Stores include Carrefour, Debenhams, and Decathlon. Vast shopping centre packed with cheap Chinese imports. One of the best duty free outlets in the world. Offers a massive range of goods including alcohol, perfumes and cosmetics, gold and jewellery, watches, luggage and leather goods. Large mall at the heart of Dubai Festival City. Boasts an entertainment level with a multiplex cinema and bowling alley. Waterfront mall at Dubai Marina. Features a branch of UK supermarket chain Waitrose and a boutique cinema. Outlet mall selling last season's goods at discounted prices. Upmarket mall at Emirates Towers. Houses some of Dubai's most exclusive boutiques. Mall specialising in jewellery, gold, silver, and precious stones. Home to hundreds of jewellery traders. Divided into 6 zones, each themed around a region visited by 14th century explorer Ibn Battuta. Underground souk at Wafi City. Stores include discount specialists Matalan and Daiso. Shopping mall in Al Qusais. Shopping mall offering more than 500 shops, an indoor ski resort, a multiplex cinema, a theatre, plus a huge selection of restaurants and fast food outlets. Community shopping mall in the Al Quoz area of Dubai. Traditional bazaar selling textiles, clothes, footwear and more. The best place to buy Arabic perfumes. Souk on the Old Town Island at Downtown Dubai. Near the Dubai Mall and Burj Khalifa. Community shopping centre at Dubai Investments Park. Recreation of a traditional souk at the Madinat Jumeirah resort. Features upmarket boutiques and souvenir shops, a theatre, and some of the city's best restaurants and bars. Narrow streets lined with stalls selling exotic spices. Open-air mall at Jumeirah Beach Residence. Dubai's biggest mall. Home to more than 1,000 stores including Bloomingdale's, Debenhams, Galeries Layfayette, Marks & Spencer, and Paris Gallery. Shopping mall opposite the Jumeirah Beach Hotel. Small community mall at the Green Community, Dubai Investments Park. Shopping mall in Al Quoz. Small shopping mall in the Jumeirah area of the city. Small shopping and community centre. Egyptian-themed mall at Wafi City. Busy fish market with hundreds of traders. Find out where you can do your grocery shopping in Dubai. Find out where you can watch the latest movies.